Pictures from Vashon Island with our resident artist, Ryan. 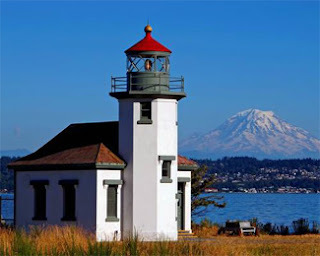 The lighthouse is at Point Robinson, Washington. Originally built in 1885, I believe. I did not take the great lighthouse photo with Mt. Rainier in the background. The credit belongs to Point Robinson. We had fun walking on the beach (it was low tide). The girls found lots of shells. The boys were building on the beach. They were having fun finding weird shaped logs and making them stand up in the sand. John Mark found driftwood he needed to bring back which the Captain at the lighthouse ok. The girls couldn't resist trying on some vintage hats in the little bookstore we stopped at. The bookstore had some amazing books and we only bought 2! I had to include one more picture of Esther and John Mark on the ferry. These were just a couple of our stops on the island. We also stopped at a beach campground which is for people traveling by boat to stop and camp for the night. They were greeted by a giant candle on a stand set up on a picnic table. We had to have ice cream along the way too! What a great sharing of your trip. What a way to get an education...history, science, geography, art. Did anyone experience a math lesson, too? Of course my grandchildren's pictures are special! Looks like you had a great visit with Ryan and some great field trips too. Hope to see you soon. I can't believe how big the kids are getting! Tell them all I said hi and I love them!! I love you!